The video below is a panel debate exploring challenges and issues for stakeholders responsible for ‘security by design and default’ plus ‘data protection by design and default’ in smart devices and systems installed in smart buildings and smart city projects. Do smart (IoT) devices equal smarter buildings and smarter cities? Are customers (enterprises) and manufacturers the only stakeholders with security responsibilities? 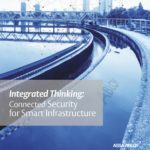 If not, what can smaller stakeholders like integrators, installers and consultants do to perform their role effectively in terms of bolstering security throughout the process? Professor Paul Dorey, director of CSO Confidential; James Willison, founder of Unified Security Ltd; Steven Kenny, industry liaison for architecture & engineering at Axis Communications; and Mike Hurst, director of HJA Consult. WATCH: Surveillance, security and privacy in the IoT A panel debate exploring challenges and issues for stakeholders responsible for 'security by design and default' plus 'data protection by design and default' in smart devices and systems installed in smart buildings and smart city projects.